Balicasag is a flat island four kilometers southwest of the Doljo Point off of Pangalo Reef, which is about 30-45 minutes from Panglao Island. Narrow reefs about nine to 49.5 meters wide, are one of the many reasons why Balicasag Island has gained popularity among many foreign and local divers. Diver's Haven is a dive site that features an impressive array of fish and marine life. Another fascinating dive site is Turtle Point, a haven for (no surprise) turtles. Turtle Point lies on the eastern side of the island and features caves about 60 to 75 meters down. Located on the southwest side is the Cathedral Wall, and the north side is The Royal Garden. The Garden is profusely covered with corals that form a psychedelic and vibrant reef full of assorted tropical fish. Last, but not least is the Black Coral Forest, where one has the rare opportunity to swim through the black coral. Cabilao, an island of 8 square kilometers is one of the smaller Philippine islands located to the west of Bohol. 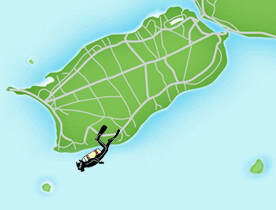 The island is an excellent site for scuba diving and snorkeling, for both beginners and professional divers. Diving in this area is centered in front of the Light House, with a depth of around 5-50 meters, this site guarantees rendezvous with various reef critters and occasional sharks! Another site found near the island is the Coconut. It's a wall that drops down to 50 meters where sea gorgonian fans and black corals can be seen. Large schools of barracudas and random black tipped reef sharks perch in this habitat. On a remote and distant side of Bohol and, southeast of Panglao lies Pamilacan Island, which is about 20 kilometers from Alona Beach. Its unique distance from the mainland has fortified the dolphin and whale population, and is also known for its barracudas and manta rays. 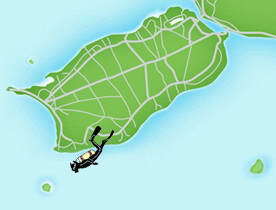 The island is a jump off to an area where at least seven species of marine mammals, including Bryde's whale and sperm whales, have been sighted. This site boasts fascinating sloped reefs with soft corals and coral heads. Aside from the white sand beach, the island is endowed with splendid dive sites nearby providing divers an impressive view of tunicates, sponges, anemones and massive gorgonians. Habagat Wreck dive site is located at Danao Beach. 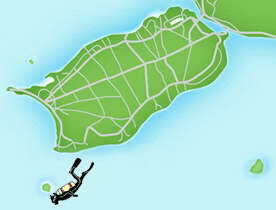 At about a depth of 8-12 meters, this site has been rated an easy dive and ideal for snorkeling. This Bohol diving site reveals interesting sea life, and further down the steep slope at 35 meters sits a boat wreck. The wreck houses Tall Fin Batfish, Giant Angel Fish, Lion Fish, Groupers and the Harlequin Ghost Pipefish. Garden Eels, 4 kilometers from Alona Beach is yet another excellent snorkeling site along the coasts of Panglao Island. Similar to the Habagat Shipwreck, this site is rated an easy dive with a depth of only 8 meters. The site starts off with a gorgeous bow-shaped cliff, followed by a beautiful coral garden on top of the wall. A myriad of small fish can be found here as well. Further down towards the bottom of the sandy slope, are some fascinating and splendid Sand Eels. The Garden Eels site is ideal for night dives. 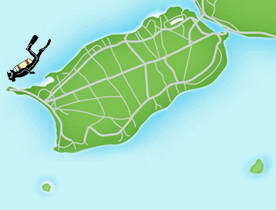 Cervera Shoal is commonly known as Snake Island or Spaghetti Reef due to the thriving amount of sea snakes found here. The site lies directly south of Panglao with a steep slope and a 300 meter wide sandbar. An abundance of black and white banded sea snakes, morays, nudibranchs and small reef fishes, some corals and bucket sponges can be seen here. The top teems with sea urchins and 100 feet further down, divers begin to see the sea snake colonies. Doljo Point located at Barangay Doljo in Panglao Island, lies precisely northwest of the island and at its ultimate tip. The beach is acclaimed for its ethereal seashells, calm deep clear waters and its florid marine biodiversity. 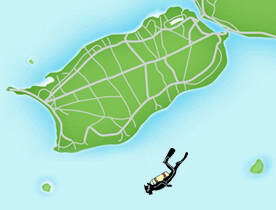 Its location and deep drop off provides divers a good chance of seeing hammerhead sharks, manta rays and whale sharks. The site has a breathtaking wall dive with multiple hard corals and sandy spots. Various cardinal fishes, gobies, nudibranchs, harlequin ghost pipefish and clown frog fish are found on this site. Danao Beach Reef is located off the southwestern tip of Panglao Island just down from Alona beach. 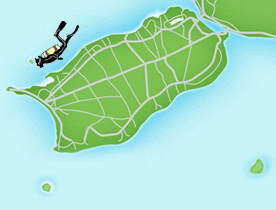 It's another nice reef and wall dive, with a nearby location for quick and easy access for the entire family.